There is a new movie coming out soon, called “Friends With Benefits.” The whole point of the movie, from the preview clips, is to see two people who claim to be “just friends,” but live as though they are husband and wife. When I was growing up, I heard a question that I think still suffices today: “Why pay for the cow when the milk is free?” This translates into, “Why will a man marry you if he can have husband benefits without commitment?”. We mourn the depravity of man and the sin in our culture today. Many have bought into this way of thinking, that it’s okay for boyfriend and girlfriend to live together before marriage. Why? This is the answer often given on talk shows and even in Christian families: “By living together, they will come to better see what life will be like when they tie the knot.” In other words, you plunge into married life now...then get married some months (or years, or decades) later. “Recently, I (David) was in a setting where someone who is yet to become a follower of Christ got up and told her ‘prayer story.’ (As of this writing, she is still not a believer.) Her husband was diagnosed with a very aggressive cancer, and many Christians had agreed to pray for him. He was later diagnosed by the doctors as having an ‘extremely unusual response to treatment.’ That is ‘doctor speak’ for him being healed. The woman sharing the story was explaining how this had made an impact on her life even though she was not yet a follower of Christ---but she was definitely open. The interesting thing is that she shared her story in a missions meeting where she was being trained for a mission trip to South Africa, where she would be doing humanitarian efforts with a Christian organization. 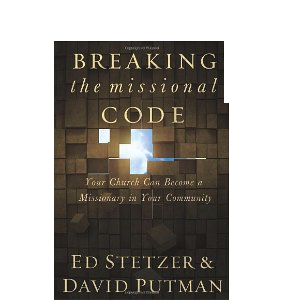 This is a simple example of what is becoming the norm in many missional churches” (Ed Stetzer and David Putman, Breaking the Missional Code: Your Church Can Become A Missionary In Your Community. Nashville: Broadman and Holman Publishers, 2006, page 126). As I said in the last post, the problem with the woman in question is that first, she was not a believer (this is mentioned about three times in the text: twice at the time she talked at the missions meeting, once in the current time this book was written). Next, as an unbeliever, “she was being trained for a mission trip to South Africa.” As I said in the last post, I don’t understand who the woman in question was laboring for if she was not laboring with the understanding that her labor of love was unto the Lord. And since the woman was not saved, she could not be consciously laboring unto the Lord. In other words, her work may have been for the church she went with, as well as some of the people in the church...but it was not a labor for God. Shouldn’t God be the first One believers labor for?? I know it might seem as if my restrictive view of Christian ministry is narrow-minded and callous; but let me take some time to explain myself. Take this understanding and apply it to the story told by David Putman. Would we not qualify the unbelieving woman as an “unbeliever with benefits?” What do I mean by this? When I say she was an “unbeliever with benefits,” I mean that this woman, though a non-Christian, was allowed to work in Christian ministry as though she was already saved. What exactly could be done on a mission trip, if one is “unevangelized” while going to “evangelize” in some sense? How fair is it that we can tell our children to not date with benefits, while we allow unbelievers to come in our churches and “date Jesus with benefits,” without coming to any faith commitment at all? Does this not contradict the things we tell our children about love, trust, and marriage commitment? If you think I’m being harsh on this, consider that Christ did not merely “date” the church; rather He married her (see Ephesians 5:25-27). In the same way, individuals who are to be saved cannot merely come in the church and “taste and see that the Lord is good” without a faith commitment (see 1 Peter 2:2-3; Psalm 34:8). The Lord will not give the unbeliever the best of Himself while the unbeliever refuses to give God the best of himself/herself. While the Lord provides for the unbeliever by allowing the sun to shine on them, they cannot “barge” their way into the kingdom of God (kingdom of heaven) without doing it God’s way---that is, to confess with the mouth the Lord Jesus and believe in their heart that God has raised Jesus from the dead (Romans 10:9). In the same way that Jesus “marries the church,” He also marries the believers in the church, those who have confessed He is the Christ and have made Him their Lord and Savior. Jesus Christ is not interested in mere “dating”; He is not interested in being an unbeliever’s “boyfriend,” or “good buddy,” or “distant associate,” etc. Rather, Christ is interested in bringing people into the kingdom by way of the gospel, which brings men and women to the knowledge of the truth (1 Tim. 2:4). If we will not allow “daters” to live together without holy matrimony, then we should not allow unbelievers to labor alongside of those of the church without “holy salvation.” I think that Dr. Ed Stetzer and David Putman are right when they say that the churches need to find a way to integrate unbelievers into church community events which may make them more receptive to the claims of Christ and the gospel; at the same time, we must “refrain from the very appearance of evil” (1 Thessalonians 5:22). We may think that allowing unbelievers such as the woman in the story, to work in Christian ministry is doing no harm; but at the end of the day, we should not be surprised if the only thing the person leaves the church with is, “you need not pay for cow (make a faith commitment to Jesus) when the milk is free (Christian ministry comes without conditions).” God bless.